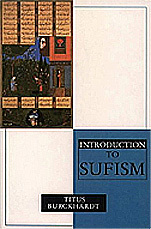 summary of the Philosophy of Sufism. beauty of the Sufi Way. Sufism, Tasawwuf,1 which is the esoteric or inward (batin) aspect of Islam, is to be distinguished from exoteric or external (zahir) Islam just as direct contemplation of spiritual or divine realities is distinguishable from the fulfilling of the laws which translate them in the individual order in connection with the conditions of a particular phase of humanity. Whereas the ordinary way of believers is directed towards obtaining a state of blessedness after death, a state which may be attained through indirect and, as it were, symbolical participation in Divine Truths by carrying out prescribed works, Sufism contains its end or aim within itself in the sense that it can give access to direct knowledge of the eternal. This knowledge, being one with its object, delivers one from the limited and inevitably changing state of the ego. 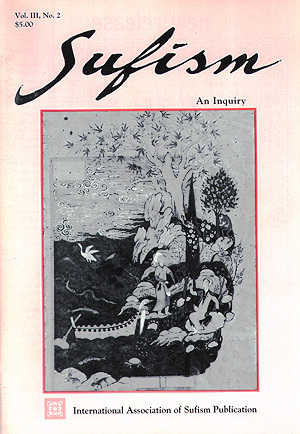 The spiritual state of baqa, to which Sufi contemplatives aspire (the word signifies pure subsistence beyond all form), is the same as the state of moksha or deliverance spoken of in Hindu doctrines, just as the extinction (al-fana) of the individuality which precedes the subsistence is analogous to nirvana, taken as a negative idea. For Sufism to permit such a possibility it must be identified with the very kernel (al-lubb) of the traditional form which is its support. It cannot be something super-added to Islam, for it would then be something peripheral in relation to the spiritual means of Islam. On the contrary, it is in fact closer to their superhuman source than is the religious exotericism and it participates actively, though in a wholly inward way, in the function of revelation which manifested this traditional form and continues to keep it alive. This central role of Sufism at the heart of the Islamic world may be veiled from those who examine it from outside because esotericism, while it is conscious of the significance of forms, is at the same time in a position of intellectual sovereignty in relation to them and can thus assimilate to itself  at nay rate for the exposition of its doctrine  certain ideas or symbols derived from a heritage different from its own traditional background. It may appear strange that Sufism should on the one hand be the spirit or heart of Islam (ruh al-islam or qalb al-islam) and on the other hand represent at the same time the outlook which is, in the Islamic world, the most free in relation to the mental framework of that world, though it is important to note that this true and wholly inward freedom must not be confused with any movements of rebellion against the tradition; such movements are not intellectually free in relation to the forms which they deny because they fail to understand them. Now this role of Sufism in the Islamic world2 is indeed like that of the heart in man, for the heart is the vital center of the organism and also, in its subtle reality, the seat of an essence which transcends all individual form . . . FOR PART TWO CLICK HERE! . . . and . . .
* Sufism gratefully acknowledges permission from Thorsons, part of HarperCollins Publishers to reprint At-Tasawwuf which comprises Chapter One from Titus Burckhardt: An Introduction to Sufism (trans. D. M. Matheson), Aquarian/Thorsons (1990). This chapter is printed in two parts due to space limitations. 1 The most usual explanation is that this word means only to wear wool (suf), the first Sufis having worn, it is said, only garments of pure wool. Now what has never yet been pointed out is that many Jewish and Christian ascetics of these early times covered themselves, in imitation of St. John the Baptist in the desert, only with sheepskins. It may be that this example was also followed by some of the early Sufis. None the less to wear wool can only be an external and popular meaning of the term Tasawwuf, which is equivalent, in its numerical symbolism, to al-Hikmat al-ilahiyyah Divine Wisdom. Al-Biruni suggested a derivation of sufi, plural of sufiya, from the Greek Sophia, wisdom, but this is etymologically doubtful because the Greek letter sigma normally becomes sin (s) in Arabic and not sad (i). It may be, however, that there is here an intentional, symbolical assonance. 2 This refers to Sufism in itself, not to is initiatic organizations. Human groups may take on more or less contingent functions despite their connection with Sufism; the spiritual elite is hardly to be recognized from outside. Again, it is a well-known fact that many of the most eminent defenders of Islamic orthodoxy, such as Abd al-Qadir Jilani, al-Ghazali or the Sulton Salah ad-Din (Saladin) were connected with Sufism.